(AFP) - Typhoon Meranti battered southeastern China with heavy winds and torrential rain on Thursday, cutting power, ripping up trees and smashing windows, a day after lashing Taiwan. The super typhoon, packing winds of 170 kilometres per hour (105 miles per hour) made landfall around 3am near the city of Xiamen before heading inland, state media said. 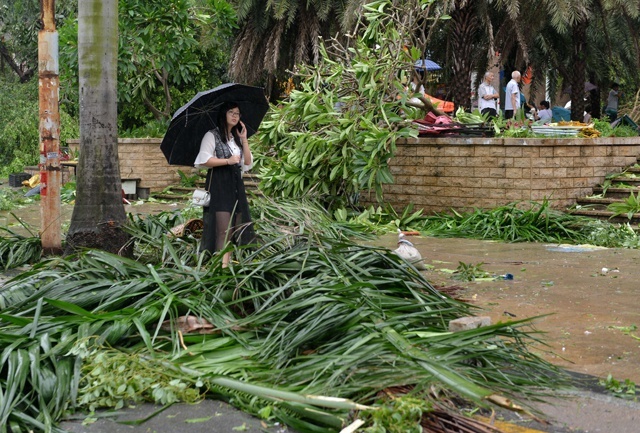 Images from Xiamen showed flooded streets, uprooted trees, and traffic signs torn from their posts by the violent winds. There were no reports of any casualties. The Xinhua news agency described the storm as the most powerful to hit Fujian province in at least 67 years, with meteorological records only going back to the founding of modern China in 1949. Local media described windows broken by flying roof tiles with fragments littering pavements and water supplies cut. Schools and many businesses were already shut for the Mid-Autumn Festival when people traditionally meet up with family for celebratory meals. Xiamen's utility providers said there had been power outages in most of the city, which is home to some 3.5 million people. Train services were disrupted throughout Fujian as well as in neighbouring Jiangxi province. Officials had earlier urged people to stay at home and ordered ships to return to port as Meranti bore down on the mainland, having lashed Taiwan on Wednesday. The storm left one person dead and 38 injured after skirting past the island's southern tip with the strongest winds recorded there in 21 years. A 58-year-old fisherman died when he fell into the water after a vessel broke from its anchor. Most of the other injuries were caused by falling objects. Thousands of others were forced to flee their homes and around 350,000 households were still without power as of Thursday morning. At the peak of the storm, more than one million households lost power. The island was also bracing for the possible impact of another tropical storm, Typhoon Malakas, which was forecast to sweep past the east coast of the island on Saturday.